Disclaimer: No, this isn't another millennial-bashing article talking about how millennials have killed this, killed that, murdered this industry, or have otherwise ruined an economy that was on its way to ruin long before they received it. We are simply identifying this demographic as important, and showing you ways you can engage and target this demographic. It might surprise you to learn that young adults between 25 to 34, not teens, use more mobile apps* than any other age group. From music, sports, and food to health, fitness, and social networks - this generation uses apps nearly every day. From a business and marketing standpoint, this means that it's critical for businesses targeting this group to be present on mobile devices, either via a native app or at the very least a highly optimized and usable mobile app. If you want to tap into this huge demographic, developing apps for millennials could be your ticket in. Millennials are arguably the most tech-savvy and productive age demographic. They demand apps that help them achieve better productivity in their lives. Millennials are redefining workplace productivity, and they need apps that keep up with this new faster pace. Apps that combine several necessary tasks in one platform, such as Evernote, are extremely successful in combining notes, calendar, and task lists, making it the ideal alternative to opening a web app. App developers should not try to form new habits or reinvent the proverbial wheel. Instead, they should focus on creating apps for millennials that integrates with current productivity habits and flow of life faster, easier, and more convenient. Efficiency and Productivity go hand in hand, and apps are no different. 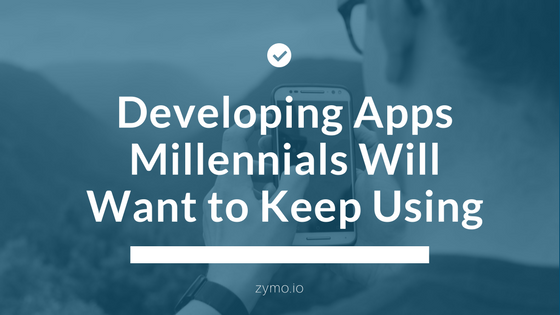 Developing mobile apps that streamline processes and eliminate extraneous steps will resonate with millennial users. Envision your audience and map out their daily processes from start to finish. Once you've done that, now is the time to discover where your app could either eliminate steps in processes or make each step more efficient. A great example is the Ticketmaster app. Although Ticketmaster was a pre-established business with a mobile website, the app allows for ticket searching, purchasing, directions to and from the event, integration with Passbook, and basically everything else you'd ever need for events to be readily available all in one convenient, efficient view. It's no surprise that this demographic cares about convenience above all. Your app could be the most amazing app ever but still get little to no traction in your target market if it does not provide the essential convenience factor. Businesses must make app usage as convenient as possible to ensure their audience stays connected and productive. In-app purchase options, integration with social channels, the calendar, passbook, etc, speedy checkouts, and frequent updates can all help businesses ensure an app that offers convenience to the user. Cross-device means that if users are signed into an account on their smartphone (app or mobile site) and another device, they can jump from one device to the other and not have to start their actions over again. This could mean adding items to a cart on an app, then going online on a desktop later to actually make the purchase. If a large number of your visitors are mobile users, you may benefit from integrating cross-device functionality into your app strategy. This is ideal if you are, for example, an e-commerce store. Users might visit your mobile app on their lunch, commute, or breaks, but hold off on making an actual purchase until they are at home on their desktop. This common purchasing technique can mean trouble for businesses that don't make the cross-device process simple, smooth, and as easy as possible. Integrating cross-device capabilities into your app is an excellent way to appeal to the always-on-the-go millennial market. Businesses know that their customers are the lifeblood of their bottom line, which is why it is so important to adapt with customers rather than stick with traditional, outdated strategies. By implementing elements of mobile apps that appeal to the goals that millennials want to accomplish, businesses can gain traction in the lucrative millennial market and appeal to the demographic that uses smartphones more than any other group.